By 2020, Internet of Things Will Create $1.9 Trillion of Economic Value Add. In 2020, Over 30 Billion Connected Devices Will Be In Use. With the digital world upon us, digitalisation will significantly change the technology market through the Internet of Things, according to Gartner, Inc. While IT spending in Europe, the Middle East and Africa (EMEA) will show an average annual growth rate of 2.2 per cent through 2017, the Internet of Things (things, people, places and systems) will create new markets and a new economy. Gartner analysts are examining the future of the digital world in front of an audience of more than 4,800 CIOs and IT leaders at Gartner Symposium/ITxpo 2013, which is taking place in Barcelona through 14 November. In 2009, there were 2.5 billion connected devices; most of these were mobile phones, PCs and tablets. 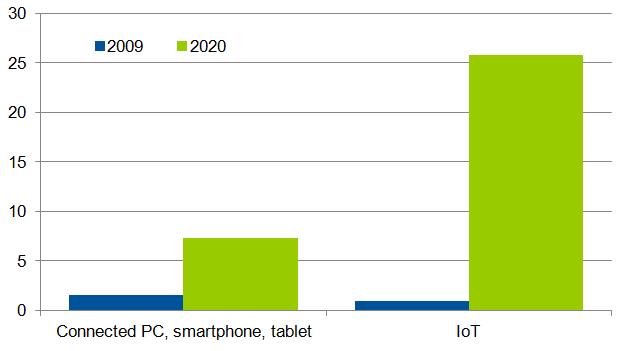 In 2020, there will be over 30 billion devices connected, of far greater variety (see Figure 1). “The Internet of Things will create greater economic value for all organisations, and for the global economy,” said Mr Sondergaard. Gartner predicts that the total economic value add for the Internet of Things will be $1.9 trillion dollars in 2020, seen across a number of industries. The verticals that are leading its adoption are manufacturing (15 per cent), healthcare (15 per cent) and insurance (11 per cent). For example, the manufacturing sector will benefit from producing billions of devices and from more efficient tracking of materials and components leading to cost efficiencies. In healthcare, smart slippers and other wearable devices for elderly people contain sensors that detect falls and various medical conditions. If something is amiss, the device will alert a doctor via e-mail or text message, possibly preventing a fall and a costly trip to the emergency room. Another example includes installing sensors in cars that provide a pay as you drive insurance that links the insurance premium to the individual’s risk profile. “The Internet of Things enables solutions that are optimised for the customer and enables new innovative business models. This will allow companies to move away from blanket pricing to more tailored solutions which benefit both company and customers,” said Mr Sondergaard. The Internet of Everything and the Nexus of Forces, which combine the physical world and the virtual, will drive organisations and their CIOs toward an all-embracing digital future. “No matter what business or service organisations deliver today, digitalisation is changing it and becoming pervasive inside organisations,” said Mr Sondergaard. The Internet of Everything will re-invent industries at three levels: business process, business model, and business moment. As companies digitalise products and process, completely new ways of doing business in industries emerge. Gartner analysts expect more transformational changes as digitalisation re-invents industries at the business model level. Mr Le Hong gave the examples of Nike, playing on the edge of the healthcare industry with its connected sporting clothes and gear, and Google having a visible presence in autonomous vehicles. “These organisations had no business in your industry, and are now re-inventing them,” said Mr Le Hong. Mr LeHong used the example of large hotel chains such as Starwood, Hilton, and Hyatt hotels that keep competing against first wave of digital business models from the e-commerce era from sites such as Hotels.com. However, the new digital business model created by companies such as AirBnB is causing these hotel chains to compete against an expanding inventory of rooms, not in other hotels, but in their customer’s own homes. Compared to where organisations were a year or two ago most CIOs have made significant progress on embracing digitalisation, yet nearly half of CIOs said that they are not ready to meet the digital challenge. Note: *The Internet of Things encompasses hardware (the ‘things’ themselves), embedded software (software running on, and enabling the connected capabilities of the things), connectivity/communications services, and information services associated with the things (including services based on analysis of usage patterns and sensor data). 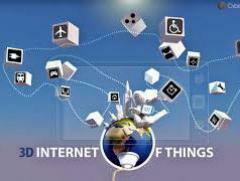 The companies that provide this hardware and these services will be referred to as Internet of Things Suppliers.